Renal malformations are a major cause of childhood renal failure. During the development of the kidney, ureteric bud (UB) branching morphogenesis is critical for normal nephrogenesis. These studies investigated whether renal UB branching morphogenesis is altered by a high ambient glucose environment and studied underlying mechanism(s). Kidney explants that were isolated from different periods of gestation (embryonic days 12 to 18) from Hoxb7–green fluorescence protein mice were cultured for 24 h in either normal d-glucose (5 mM) or high d-glucose (25 mM) medium with or without various inhibitors. Alterations in renal morphogenesis were assessed by fluorescence microscopy. Paired-homeobox 2 (Pax-2) gene expression was determined by real-time quantitative PCR, Western blotting, and immunohistology. The results revealed that high d-glucose (25 mM) specifically stimulates UB branching morphogenesis via Pax-2 gene expression, whereas other glucose analogs, such as d-mannitol, l-glucose, and 2-deoxy-d-glucose, had no effect. The stimulatory effect of high glucose on UB branching was blocked in the presence of catalase and inhibitors of NADPH oxidase, mitochondrial electron transport chain complex I, and Akt signaling. Moreover, in in vivo studies, it seems that high glucose induces, via Pax-2 (mainly localized in UB), acceleration of UB branching but not nephron formation. Taken together, these data demonstrate that high glucose alters UB branching morphogenesis. This occurs, at least in part, via reactive oxygen species generation, activation of Akt signaling, and upregulation of Pax-2 gene expression. This work is designed to demonstrate the influence of a high-glucose milieu on UB branching morphogenesis and its underlying mechanism(s) using real time in an ex vivo model. Additional in vivo studies that complement the ex vivo studies are also included. Our results indicate that high glucose stimulates UB branching via ROS generation and Pax-2 gene expression. We conclude that the stimulatory effect of high glucose is mediated, at least to some extent, via activation of NADPH oxidase and mitochondrial oxidative metabolism and stimulation of Akt signaling pathway. Kidney explants that were isolated from timed-pregnant mice at embryonic day 13 (E13) were cultured either in normal (5 mM) d-glucose DMEM plus 20 mM d-mannitol (left kidney) or high (25 mM) d-glucose DMEM (right kidney) supplemented with 1% depleted FBS (dFBS) up to 96 h with fresh medium changed every 24 h. As seen in fluorescence microscopic sequential images, as compared with 5 mM glucose (Figure 1, A and B), 25 mM d-glucose (Figure 1, C and D) stimulates UB branching morphogenesis in a time-dependent manner. Because a stimulatory effect of high glucose is present after 24 h of incubation, we used 24 h of stimulation for subsequent studies. By carefully measuring the diameter of metanephroi that were cultured from 0 to 96 h (Figure 1E), we found that high glucose reduced the size of metanephroi in a time-dependent manner. High d-glucose stimulates ureteric bud (UB) branching in a time-dependent manner. Kidney explants that were isolated from time-pregnant mice at embryonic day 13 (E13) were cultured in either normal (5 mM) d-glucose DMEM (left kidney) or high (25 mM) d-glucose DMEM (right kidney) supplied with 1% dFBS up to 96 h with fresh medium changed every 24 h. The UB branching morphogenesis sequential images were recorded by fluorescence microscope. (A and B) Representative of the kidney explants that were cultured in 5 mM glucose supplemented with 20 mM d-mannitol DMEM to maintain constant isotonicity or osmolality. (C and D) Representative of the kidney explants that were cultured in 25 mM glucose DMEM. The sequential images was recorded by every 24 h. (E) High ambient glucose reduced the surface area of cultured metanephroi in a time-dependent manner. Magnifications: ×2 in A and C; ×10 in B and D.
E13 kidney explants were incubated in medium that contained 1% dFBS and 25 mM different glucose analogues such as d-mannitol, l-glucose, 2-deoxy-d-glucose, and d-glucose. 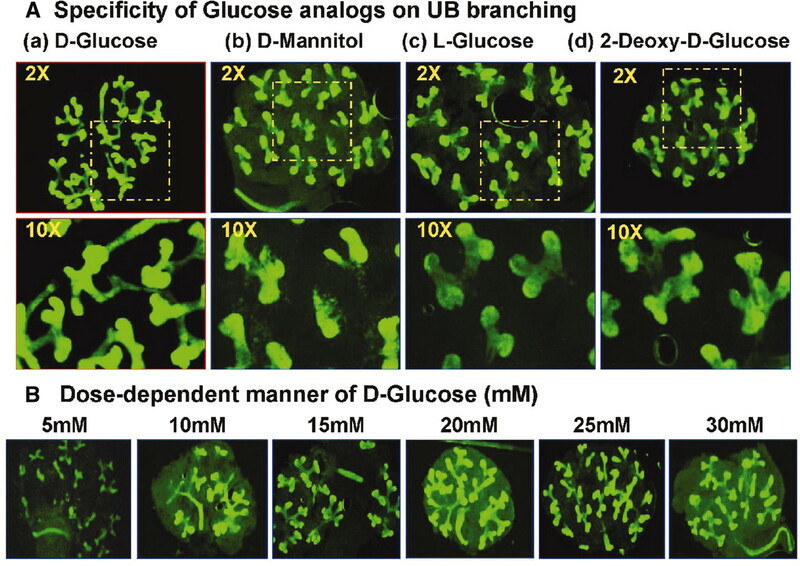 After incubation for 24 h, high d-glucose (Figure 2A-a) specifically stimulates UB branching morphogenesis by fluorescence microscopy, whereas other glucose analogs, such as d-mannitol (Figure 2A-b), l-glucose (Figure 2A-c), and 2-deoxy-d-glucose (Figure 2A-d), had no effect. Moreover, high d-glucose stimulates UB branching in a dosage-dependent manner (Figure 2B). For maintaining constant isotonicity or osmolality, 5 mM glucose medium was supplemented with d-mannitol (20 mM final concentration) in additional studies. High glucose stimulated a greater than two-fold increase of UB tip numbers as compared with normal glucose (Figure 3). This increase in UB branching is induced by high d-glucose (25 mM) but not by other glucose analogs. High d-glucose on UB branching morphogenesis. (A) Specificity of the effect of glucose analogs on UB branching. E13 kidney explants were incubated in medium that contained 1% dFBS and 25 mM different glucose analogues, such as d-glucose (a), d-mannitol (b), l-glucose (c), and 2-deoxy-d-glucose (d), for 24 h. The images were recorded by fluorescence microscope (2X and 10X magnification). (B) The d-glucose dosage-dependent effect on UB branching from 5 to 30 mM in E13 kidney explant. Magnifications: ×2 in A and B; ×10 in A. High d-glucose stimulates UB branching morphogenesis. (A) E13 kidney explants were incubated in either 5 (left kidney) or 25 mM glucose DMEM (right kidney) that contained 1% dFBS for 24 h. The images were recorded by fluorescence microscope. (B) Quantification of UB numbers. Kidney explants that were incubated in 5 mM glucose were considered the control (100%). Each point represents the mean ± SD of three independent experiments. *P ≤ 0.05; **P ≤ 0.01; ***P ≤ 0.005. Magnifications: ×2, ×4, and ×10. High glucose increased Pax-2 gene and protein expression—mRNA (real-time quantitative PCR [RT-qPCR]; Figure 4A) and protein (Western blot; Figure 4B)—as compared with normal glucose in E18 kidney explants. Immunohistologic staining indicated that the upregulation of Pax-2 is localized mainly to the UB (Figure 4C). These data indicate that high glucose stimulation of UB branching morphogenesis is mediated via Pax-2 gene expression. High glucose upregulates Pax-2 expression in E18 kidney explant as analyzed by real-time quantitative PCR (RT-qPCR; A) Western blot (B), and immunohistologic staining (C). The normalized Pax-2 level in explants that were incubated in 5 mM glucose was considered the control (100%). Each point represents the mean ± SD of three independent experiments. *P ≤ 0.05; **P ≤ 0.01; ***P ≤ 0.005. Magnifications: ×20 and ×32. It is apparent that inhibitors of NADPH oxidase (diphenylene iodinium [DPI]; 10−6 M) and mitochondrial electron transport chain complex I (rotenone, 10−6 M) block the stimulatory action of high glucose on Pax-2 expression (Figure 5) and UB branching morphogenesis (Figure 6) in E14 kidney explants. These data indicate that the stimulatory effect of high glucose is mediated, at least in part, via NADPH oxidase activation and ROS generation. Inhibitory effect of diphenylene iodinium (DPI) and rotenone on Pax-2 gene expression in E16 kidney explants. E16 kidney explants were cultured in either 5 or 25 mM glucose DMEM with or without DPI (10−6 M) and rotenone (10−6 M) for 24 h. The Pax-2 gene expression was analyzed by either RT-qPCR (A) or Western blot (B). The relative densities of Pax-2 were compared with β-actin. The normalized Pax-2 level in kidney explants that were incubated in 5 mM glucose was considered the control (100%). Each point represents the mean ± SD of three independent experiments. *P ≤ 0.05; **P ≤ 0.01; ***P ≤ 0.005. Inhibitory effect of DPI and rotenone on UB branching morphogenesis stimulated by high glucose. E14 kidney explants were incubated in either 5 (A) or 25 mM glucose DMEM (B) in the absence or presence of DPI (10−6 M; C) and rotenone (10−6 M; D) for 24 h. The images were recorded by fluorescence microscope. (E) Quantification of UB numbers. Kidney explants that were incubated in 5 mM glucose were considered to be controls (100%). Each point represents the mean ± SD of three independent experiments. *P ≤ 0.05; **P ≤ 0.01; ***P ≤ 0.005. Magnifications: ×2 and ×10. We previously reported that H2O2 modestly increases Pax-2 gene expression. However, this stimulatory effect of H2O2 was significantly enhanced in the presence of high glucose in E16 kidney explants.22 The question has been raised about whether H2O2 also directly modulates UB branching. 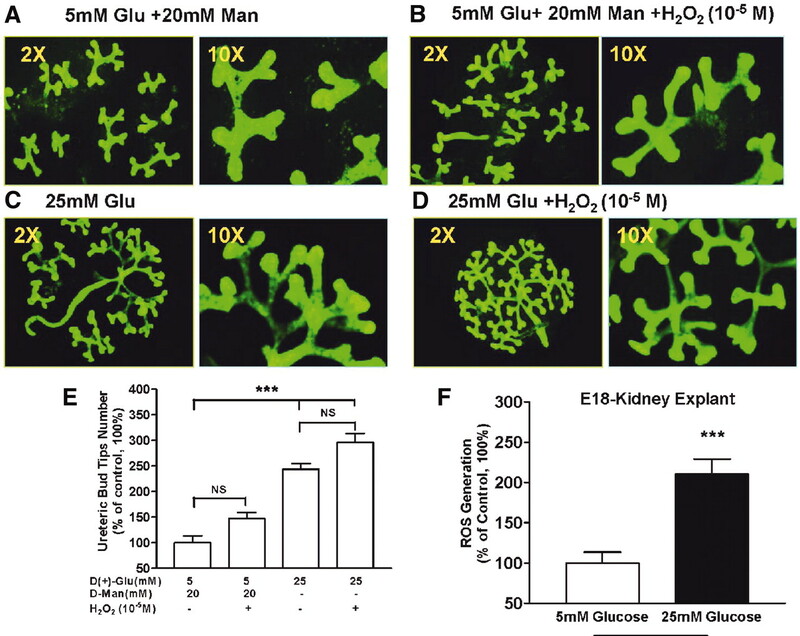 Indeed, exogenous H2O2 at 10−5 M could trigger UB branching morphogenesis, particularly in the presence of high glucose in E13 kidney explants (Figure 7, A through E). Our data also indicate that high glucose activates the total ROS generation in E18 kidney explant (Figure 7F). Moreover, high glucose–induced UB branching in E12 kidney explants could be partially blocked by catalase (250 U) and completely abolished by Akt inhibitor IV (a cell-permeable benzimidazole compound that inhibits Akt phosphorylation/activation by targeting the ATP binding site of a kinase upstream of Akt but downstream of phosphatidylinositol-3-kinase [PI3-K]) at a concentration of 10−6 M (Figure 8). Similar results were also found in Pax-2 mRNA and protein expression (Figure 9). These data indicate that high glucose evokes ROS generation and upregulates Pax-2 gene expression via Akt signaling and subsequently stimulates UB branching morphogenesis. H2O2 effect on UB branching morphogenesis in E13 kidney explants. E13 kidney explants were incubated in either 5 (A and B) or 25 mM glucose DMEM (C and D) with or without H2O2 (10−5 M) for 24 h. The images were recorded by fluorescence microscope. (E) Quantification of UB numbers. Kidney explants that were incubated in 5 mM glucose were considered as controls (100%). (F) reactive oxygen species (ROS) generation was assessed by lucigenin method, and the final value of ROS generation was normalized by the protein concentration of sample. The normalized ROS generation in cells that were incubated in 5 mM glucose was considered as the control (100%). Each point represents the mean ± SD of three independent experiments. *P ≤ 0.05; **P ≤ 0.01; ***P ≤ 0.005. Magnification, ×10. Inhibitory effect of catalase and AKT inhibitor on UB branching morphogenesis in E12 kidney explants. E12 kidney explants were incubated in either 5 (A) or 25 mM glucose DMEM (B) in the absence or presence of catalase (250 U; C) and AKT inhibitor (10−6 M; (D) for 24 h. The images were recorded by fluorescence microscope. (E) Quantification of UB numbers. Kidney explants that were incubated in 5 mM glucose were considered the control (100%). Each point represents the mean ± SD of three independent experiments. *P ≤ 0.05; **P ≤ 0.01; ***P ≤ 0.005. Magnifications: ×2 and ×10. Inhibitory effect of catalase and AKT inhibitor on Pax-2 gene expression in E17 kidney explants. E17 kidney explants were cultured in either 5 or 25 mM glucose DMEM with or without catalase (250 U) and AKT inhibitor (10−6 M) for 24 h. The Pax-2 gene expression was analyzed by either RT-qPCR (A) or Western blot (B). The relative densities of Pax-2 were compared with β-actin. The normalized Pax-2 level in kidney explants that were incubated in 5 mM glucose was considered the control (100%). Each point represents the mean ± SD of three independent experiments. *P ≤ 0.05; **P ≤ 0.01; ***P ≤ 0.005. We have used streptozotocin (STZ) to induce gestational diabetes in the pregnant mother at E13.23–29Figure 10A shows our experimental protocol in detail. As may be seen, the newborn offspring of STZ-induced diabetic dams remained significantly smaller and lighter (average 20% less body weight) as compared with offspring of control dams (control versus STZ: 1.414 ± 0.11 versus 1.03 ± 0.07 g; Figure 10B). Most impressive, kidneys of the diabetic offspring were significantly smaller and growth retarded as compared with the kidneys of control offspring (Figure 10C). In vivo studies on the effect of maternal diabetes on the neonatal kidney of the offspring. (A) Representative mouse in our experimental protocol in detail. Streptozotocin (STZ)-induced diabetic newborn offspring remained significantly smaller and lighter (average 20% less) as compared with control animals, as shown in B (control versus STZ: 1.414 ± 0.11 versus 1.03 ± 0.07 g). Kidney of diabetic offspring was significantly smaller and growth retarded (hematoxylin/eosin staining and Dolichos Biflorus Agglutinin staining) compared with control (C). We evaluated the Pax-2 gene expression as analyzed by immunohistologic staining (Figure 11, A and B), qRT-PCR (Figure 11C), and Western blot (Figure 11D) in neonatal kidney of both control and diabetic dams. Our data indicated that maternal hyperglycemia via Pax-2 (mainly localized in UB) seems to accelerate UB branching but not nephron formation in neonatal kidney of diabetic dams. In vivo Pax-2 expression in neonate kidney. Pax-2 immunohistologic staining in newborn kidney of offspring: Control (A) and STZ (B). Pax-2 gene expression in neonatal kidney was analyzed by qRT-PCR (C) and Western blotting (D). The normalized Pax-2 level in control neonate kidney was considered as 100%. Each point represents the mean ± SD of three independent experiments. *P ≤ 0.05; **P ≤ 0.01; ***P ≤ 0.005. Magnifications: ×2 and ×10. In this study, we observed that high glucose alters UB branching morphogenesis via Pax2 gene expression. The high glucose effect seems to be mediated, at least in part, via ROS generation and activation of the PI3-K–AKT pathway. Maternal diabetes creates a high-risk intrauterine environment that has been directly linked to the development of congenital renal abnormalities, including caudal regression syndrome, which is highly associated with renal agenesis and abnormalities of the kidney and urinary tract.8–11 These anomalies have been noted as either isolated events or part of multiple malformation syndromes that are more common in offspring of mothers with diabetes. The incidence seems to be proportional to the degree of maternal hyperglycemia. For example, in the human, a high-glucose ambient environment throughout pregnancy (pregestational diabetes) is present before embryonic development, which may result in a fetus with markedly teratogenic features that may include the caudal regression syndrome. In experimental Hoxb7-GFP mice in our study, when the pregnant dams were exposed to STZ before the budding process, in which the Wolffian duct becomes UB, the dams were barely able to deliver. We observed the same consequences: Teratogenic embryos including caudal regression syndrome with renal agenesis under those conditions. On the basis of the timing found in the literature26,27 and our own experiences, we induced gestational diabetes by STZ injection at E13, and we successfully managed to obtain small litters of offspring from diabetic dams. Because the budding process is already completed before E13, from day E13 to birth, it seems likely that the high-glucose ambient environment may impair the nephrogenesis. To understand the effect of high glucose per se on renal UB development and its underlying molecular mechanisms, we used Hoxb7-GFP–transgenic mice20,21 as a model with which we would be able to monitor UB branching under normal- or high-glucose condition ex vivo. By using sequential images, we observed that E13 kidney explant cultured in high D(+) glucose (25 mM) condition display more UB branching as compared with normal-glucose medium (5 mM). A stimulatory effect was obvious at 24 h after exposure. Moreover, high D(+) glucose specifically triggers UB branching morphogenesis and increased UB tip numbers in a dosage-dependent manner, whereas other glucose analogs, such as d-mannitol, l-glucose, and 2-deoxy-d-glucose, had no effect. We previously reported that high glucose specifically induces Pax-2 gene expression via ROS generation in E16 kidney explants from Hoxb7-GFP mice.22 In this study, we observed that high glucose elevated total ROS generation and triggered UB branching morphogenesis. It seems that the stimulatory effect of high glucose could be blocked by ROS inhibitors such as DPI and rotenone. Although the Pax-2 gene is expressed in both UB and MM lineages,12,34–39 our immunohistologic staining data have clearly revealed that the greatest upregulation of Pax-2 by high glucose is in the area of the UB. Meanwhile, to clarify the direct functional impact of ROS on UB branching morphogenesis, we also tested H2O2, an important source of superoxide, and observed that exogenous H2O2 at 10−5 M stimulates UB branching morphogenesis; however, in combination with high glucose, the H2O2 stimulatory effect is enhanced substantially, the similar response pattern as Pax-2 gene expression.22 Taken together, our data suggest that high glucose–induced ROS generation has a functional impact on UB lineage ex vivo. Evidence indicates that the high glucose–ROS–PI3-K/Akt–NF-κB pathway seems to be a major signaling pathway that almost covers all major renal cell types.40–45 This scenario has been postulated as that by which high glucose leads to kidney damage.40–45 Indeed, one study46 suggested that downregulation of Pax-2 expression correlates with a decreased Akt phosphorylation and an enhanced sensitivity to renal endothelial cell apoptosis both in vivo and in vitro, suggesting that Pax-2 promotes angiogenesis, likely via survival, proliferation, invasion, and cell organization via the PI3-K/Akt-dependent pathway. Therefore, we hypothesized that the pathway high glucose→ROS→Akt→NF-κB→Pax-2 is involved in impairment in the UB lineage induced by high glucose. Indeed, our data suggest that high glucose action on UB branching morphogenesis as well as on Pax-2 gene expression could be completely abolished by Akt inhibitors but partially blocked by catalase. The reason for this partial blocking effect may be because catalase could only convert H2O2 into H2O but has no effect on other species, such peroxynitrites, hydroxyl radicals, etc. Indeed, more studies are needed to elucidate the action of other ROS. We used STZ to induce gestational diabetes in an in vivo model to generate a high-glucose ambient environment during pregnancy. We observed that this impaired UB branching morphogenesis in E13 pregnant Hoxb7-GFP mice. This in vivo strategy avoids the limitations that are imposed by using ex vivo studies. Our data indicate that the body weight (in g) of neonate offspring from the diabetic mother remained significantly lower and smaller (average 20% less) than that in control animals. Renal morphology revealed that kidneys of diabetic offspring showed growth retardation. However, it seems that high glucose via Pax-2 (mainly localized in UB) could accelerate UB branching but not nephron formation, but at the same time, high glucose also triggers cell apoptosis in both UB and nephron, which we believe is the major mechanism by which renal function is ultimately affected in diabetic offspring over time (our long-term follow-up study). Our data demonstrate that high glucose alters UB branching morphogenesis via Pax-2 gene and protein expression. The stimulatory effect of high glucose seems to be mediated via ROS generation and activation of the Akt signaling pathway. Normal-glucose medium (5 mM d-glucose DMEM [cat. no. 12320]) was purchased from Invitrogen (Burlington, ON, Canada). D(+)-glucose, l-glucose, d-mannitol, 2-deoxy-d-glucose, DPI, rotenone, H2O2, catalase, and 5-(2-benzothiazolyl)-3-ethyl-2-[2-(methylphenylamine)ethenyl]-1-phenyl-1H-benzimidazolium iodide (Akt Inhibitor IV) were purchased from Sigma-Aldrich Canada Ltd. (Oakville, ON, Canada). Mouse anti–β-actin mAb (clone AC-15) and rabbit polyclonal anti–Pax-2 antibody were purchased from Sigma-Aldrich Canada Ltd. and Covance (Richmond, CA), respectively. We used the murine Hoxb7-GFP model20,21 (obtained from Dr. Frank Costantini, Department of Genetics and Development, Columbia University Medical Center, New York, NY), which is useful for studying alterations in UB branching morphogenesis because the GFP permits direct observation of the branching process. This is especially useful for studying adverse in utero development as in diabetes. Hoxb7-GFP mice express GFP driven by the Hoxb7 promoter throughout the Wolffian duct and UB epithelium but not in the surrounding MM or its epithelial derivatives, allowing UB branching morphogenesis to be visualized in real time during growth of the kidney, either in organ culture or in fixed tissue.20,21 We used these features for the direct study of UB branching morphogenesis pattern under nondiabetic and diabetic conditions ex vivo. Animal care in these experiments met the standards set forth by the Canadian Council on Animal Care, and the procedures used were approved by Institutional Animal Care Committee of the Centre hospitalier de l'Université de Montréal. Hoxb7-GFP mice were housed under standard humidity and lighting conditions (12-h light-dark cycles) and were allowed free access to standard mouse diet and water ad libitum. Timed-pregnant mice aged 8 to 10 wk were used in all experiments. Vaginal wet mounts were made to determine the estrous cycles of the mice. On the evening before estrus, female mice were housed overnight with male mice; the presence of spermatozoa in a vaginal smear the next morning was defined as day 1 of pregnancy. Embryos (E12 to E18) were dissected aseptically from timed-pregnant mice, and the metanephroi were isolated under sterile conditions.22 GFP-positive metanephroi were photographed immediately after isolation (time 0) and were individually cultured in 1 ml of either normal-glucose (5 mM) or high-glucose (25 mM) DMEM supplied with 1% dFBS, 100 U/ml penicillin, and 100 μg/ml streptomycin in 95% air and 5% CO2 at 37°C in separate wells of a 24-well plate for different time periods, depending on the experiment. For example, we constantly monitored and recorded every 8 h the sequential images of UB branching in metanephroi that were cultured either in normal-glucose or high-glucose DMEM supplied with 1% dFBS condition up to 96 h with fresh medium changed every 24 h. On the basis of initial results, a 24-h incubation period was subsequently used for the rest of our experiments. The surface area of cultured metanephroi in either 5- or 25-mM glucose DMEM from time 0 to time 96 h was measured by QCapture Pro 5.1 image analysis program provided in Olympus 1× 71 Microscope (Carsen, Ontario, Canada). To address the variability in embryonic kidney size and in UB branching patterns among conceptuses, we studied the effect of various treatments on UB branching in kidneys from the same fetus; for example, the left kidney was incubated with normal glucose and the right kidney with high d-glucose or l-glucose, or the left kidney was incubated with high d-glucose and the right kidney with high d-glucose in the presence or absence of DPI (10−6 M), rotenone (10−6 M), catalase (250 U), and Akt inhibitor (10−6 M). Sequential images of branching UB were recorded with a Olympus 1× 71 Microscope. Quantitative assessment of UB branching in each treatment group was performed by manually counting the number of UB tips at time 0 and at 24 h.
Western blots were performed as in previous studies.22,47,48 Briefly, small aliquots (20 to 50 μl) of homogenized kidney explant sample were subjected to 10% SDS-PAGE and then transferred onto a polyvinylidene difluoride membrane (Hybond-P; GE Healthcare Biosciences, Baie d'Urfe, Quebec, Canada). The membrane was first blotted for anti–Pax-2 and then reblotted for β-actin. The relative densities of the Pax-2 versus β-actin bands were measured by computerized laser densitometry. Kidney explants were fixed in 4% paraformaldehyde in PBS (Fisher Scientific, Nepean, ON, Canada) after 24 h in culture and then paraffin embedded. Kidney sections of 5 μm were deparaffinized in xylene and rehydrated. Immunohistochemical examination was performed by the standard avidin-biotin-peroxidase complex method (ABC Staining System; Santa Cruz Biotechnologies, Santa Cruz, CA). Endogenous peroxidase was inhibited in 1% hydrogen peroxide–methanol for 10 min at room temperature and followed by trypsin treatment for 10 min in a moist chamber at 37°C. After serum blocking, the sections were incubated with primary anti–Pax-2 polyclonal antibody diluted 1:100 overnight at 4°C humidity chamber, then biotinylated secondary antibody was added, followed by the addition of preformed ABC reagents supplied by the ABC kit. The Pax-2 protein was visualized by color development with 3,3′-diaminobenzidine tetrahydrochloride. All sections were counterstained with hematoxylin, dehydrated, and covered with glass coverslips. ROS production was monitored by the lucigenin method with minor modifications.22,49,50 ROS that were generated in E18 kidney explant were normalized with protein concentration and expressed as relative light units per milligram of protein. We induced gestational diabetes in pregnant Hoxb7-GFP mice with an intraperitoneal injection of STZ (150 mg/kg body wt) at E13.23–29 Maternal glucose concentration (mM) was carefully monitored by Accu-Chek Compact Plus Blood Glucose Meter (Roche Diagnostics, Laval, QC, Canada; Figure 10 A). Newborn birth weight was carefully recorded, as shown in Figure 10B. Hematoxylin/eosin staining was used to review renal morphology, whereas Dolichos Biflorus Agglutinin-FITC (Vector Laboratories) staining was used for UB identification15 in 5 μm of paraformaldehyde (4%)-fixed, paraffin-embedded kidney sections under a light microscope (Figure 10C). Pax-2 expression was analyzed by immunohistologic staining, qRT-PCR, and Western blot as mentioned previously (Figure 11). Statistical significance between experimental groups was analyzed initially by t test or by one-way ANOVA followed by the Bonferroni test as appropriate. Three to four separate experiments were performed for each protocol. Data are expressed as means ± SD. P ≤ 0.05 was considered statistically significant. This research was supported by KRESCENT and Kidney Foundation of Canada and a New Investigator Award from KRESCENT of Kidney Foundation of Canada for Shao-Ling Zhang. We acknowledge the kind gifts of Hoxb7-GFP mice from Dr. Frank Costantini (Columbia University, New York, NY). Thanks are also due to Dr. John S.D. Chan (CHUM-Hôtel-Dieu, Montreal, QC, Canada) for unconditional support and discussion for the project. The editorial assistance of Ovid Da Silva (Research Support Office, Research Centre, CHUM) is acknowledged.